Published: Oct. 29, 2008 at 09:38 p.m. The Texans' success rate rises dramatically when wideout Andre Johnson is involved in the team's offense. Wide receivers in the NFL are viewed like defensive ends: Make three or four impact plays a game and that could be enough to swing momentum, maybe even determine the outcome. 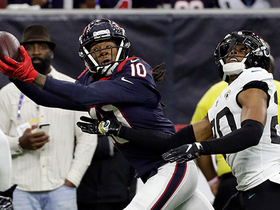 Over the past month, Houston wide receiver Andre Johnson has made more than 10 plays an outing, resulting in him ranking as the top player at his position and the Texans winning three consecutive games. His four-week totals are mind-boggling: 41 receptions, 593 yards and two touchdowns. For the season, he has 56 catches for an NFL-high 772 yards. To emphasize how good he has been over the past four weeks, a game-by-game breakdown: nine catches, 131 yards and a touchdown vs. Indianapolis, the Texans' only loss in the stretch -- and most crushing of the season; 10 receptions, 178 yards, touchdown vs. Miami; 11 catches, 141 yards vs. Detroit; 11 receptions, 143 yards against Cincinnati. On Sunday, Johnson can become the first player to have five consecutive games with more than 130 receiving yards. "I've been given more opportunities and a lot of it is making the best of those opportunities," Johnson said. "That's the biggest thing." Johnson lit up a group of teams that haven't exactly proven themselves to be stout foes, especially on defense. Even so, the sixth-year wide receiver is a marked man. Name someone other than Johnson or Matt Schaub on Houston's offense. Maybe rookie tailback Steve Slaton, who is off to a good start, but his reputation was made at West Virginia University. Teams know Johnson is getting the ball. They know how he's going to get it. Houston has thrown the ball 49 more times (244 attempts) than it has run it (195). Johnson has been double-teamed, bracketed, jammed at the line of scrimmage, you name it. On Sunday, Andre Johnson can become the first receiver with at least 130 yards in five consecutive games, and the first to catch at least 10 passes in four consecutive games. Still, the 6-3, 223-pound veteran is finding a way. He's finding it better than mainstays Terrell Owens, Randy Moss, Chad Johnson and Marvin Harrison, who not only have been deemed ordinary at times by defensive schemes, but who don't even rank among the top 18 wide receivers in total yards. So, Johnson caught just two balls in a loss to Tennessee and three against Jacksonville. He can't do it against a good defense, right? He nabbed 10 passes for 112 yards against Pittsburgh. "I'm not really doing anything different than I've normally been doing," said Johnson, a two-time Pro Bowl player. "We've found holes in teams' defenses and we've taken advantage of them. Again, I've been given a lot of opportunities to make some plays and I've been able to make them." As simple as that sounds, Johnson explained why (and this is why the slew of upcoming opponents need to take notice). He is almost fully recovered from an offseason arthroscopic procedure to repair damage to two ligaments in his left knee. He can't wait until he feels 100 percent because then, he said, he can start to play up to his ability. So this was just an appetizer? "At the beginning of the season, I was frustrated," he said. "We weren't winning. I was coming off the injury. I still was out there limping around and I wasn't having fun. Now I'm having fun. I missed a lot of training camp. I didn't play but in one preseason game and I wasn't involved. Now I'm going through all of practice. Things are starting to come together." The Texans are the NFL's second-hottest team behind unbeaten Tennessee (7-0), which leads the AFC South, where Houston dwells. 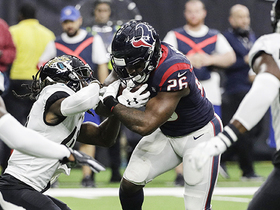 The Texans' emergence -- they are tied with divisional rivals Indianapolis and Jacksonville at 3-4 -- and Johnson's big month go hand-in-hand. When Johnson plays and is involved, Houston's success rate is far greater than when he's not in the lineup or when he's not a big part of the game plan. 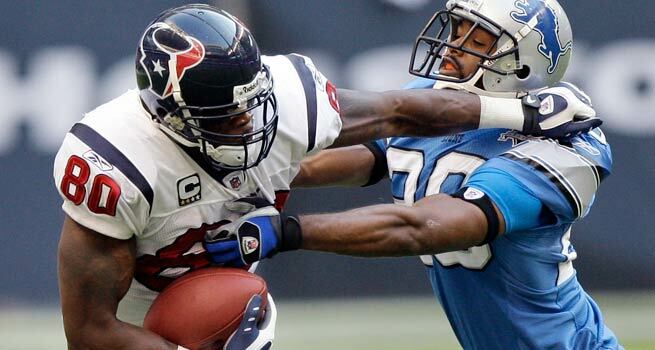 In 2007, after the offseason acquisition of Schaub, Houston won its first two games, with Johnson catching 14 passes for 262 yards and three touchdowns. He missed the next seven games with the knee injury and Houston lost five times. When Johnson returned, the Texans went 4-3 to finish 8-8. 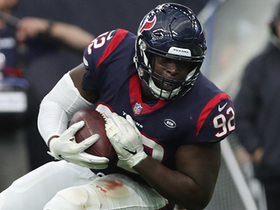 After Houston's slow start this season, which could partially be blamed on the team's displacement due to Hurricane Ike -- and Johnson's recovery from the knee injury -- the Texans are red hot, to the point where an argument could be made that Johnson might be the the most valuable player -- in terms of his value to his team -- who's neither a quarterback nor a running back. A case could be made for Carolina wide receiver Steve Smith, who, after missing the first two games of the season because of a suspension, is second to Johnson in yards per game (102) and has his team atop of the NFC South (6-2). The San Diego Chargers (3-5), who just fired defensive coordinator Ted Cottrell because of a poor pass defense, obviously miss pass-rusher Shawne Merriman, who is on injured reserve after knee surgery. 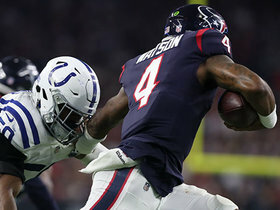 The Colts (3-4) simply aren't the same team without defensive enforcer Bob Sanders, the Pro Bowl safety who has missed five games but is due to return soon. 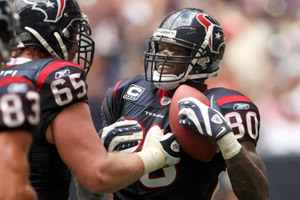 Want to vote for Andre Johnson to represent the AFC at the Pro Bowl? Go ahead! The polls are open! Vote now for your favorite players for the 2009 NFL Pro Bowl. Vote here! There are others, but the list isn't long. "I never really looked at it like that," Johnson said. "I just try to go out and do whatever I need to do to help. Whether that's going out and catching eight or nine balls or blocking. I just want to win, that's all. I don't care about all the recognition. More than anything, one day, I want to go out and help this team get to the playoffs. Once we're there, who knows? Maybe we can compete for a Super Bowl." Johnson curbed his enthusiasm for a second. Things are going well, but Houston's pending docket includes Minnesota, Baltimore, Indianapolis, Cleveland, Jacksonville, Green Bay, Tennessee, Oakland and Chicago. That's murder's row compared to the opponents Johnson and the Texans have feasted on recently. Still, Johnson feels a measure of respect is soon forthcoming. If he can run through defenses set to stop him, Houston can match up with any opponent. "We feel good," Johnson said. "We can't get big-headed, though. We have to keep the same attitude that we've had the past couple weeks. I don't know what other teams think about us but if we keep playing the way we've played, we can compete with anybody."